The people of Israel called the food manna. It was like small white seeds and tasted like wafers made with honey. The logo I often look for while shopping. One of the many gluten-free products I use. Several years ago, my mother-in-law was diagnosed with Celiac disease. This means she cannot eat anything with wheat or regular flour in it. 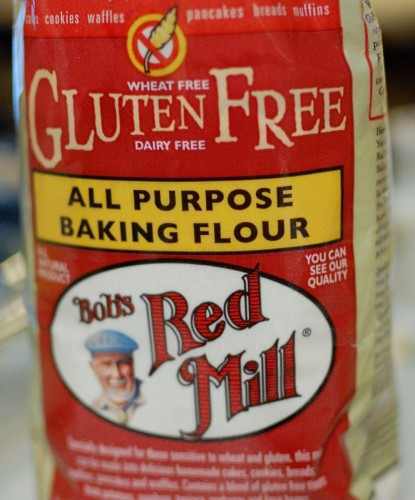 At the time of her diagnosis, finding gluten-free items at the grocery story was difficult. I searched on-line for alternative flours and ordered them. I bought gluten-free cookbooks and googled recipes. 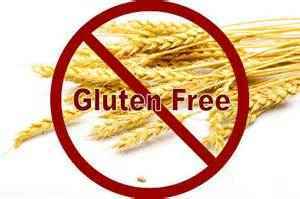 As Celiac disease has become more common and some people choose not to eat as much gluten, more gluten-free products are available. Last fall, Ersel was also diagnosed as type-2 diabetic. When I began family leave, I armed myself with a couple gluten-free, sugar-free cookbooks. Of course, the internet is a well of information and why having internet access is helpful! I have discovered new ways to cook. While I have cooked gluten-free many times, now I cook gluten-free and sugar-free most days of the week. And it is different! There is a reason why we use wheat flour. Some things have been more successful than others. A challenge is keeping things moist. Tonight’s biscuits were as light and fluffy as those made with regular flour. After multiple attempts, I found an acceptable pie crust recipe but am not convinced “flaky” and “gluten-free” can be in the same recipe. Likewise, various sugar forms have different results. For 40 years, the Israelites wandered the desert and had only two things to eat: manna and quail. Imagine 40 years of the same food, day after day. When manna is described as “wafers made with honey,” I hope it was sweet and not as dry as some of the gluten-free things. Many people have a love relationship with food. We love good food. Why did the Israelites have to eat the same thing for 14,600 days? God wanted them to depend upon God and not what they ate. They became so bored with manna they complained and complained and even wished they had never left Egypt. That’s a pretty low pot-shot, considering what Moses and God went through. I know there are days my mother-in-law would love to have a peanut butter sandwich with real bread. But she cannot. On the days we’re not at the farm, I cook with all the regular flour I want. I eat peanut butter toast most mornings. I try creative ways to cook without gluten, just as the Jews tried preparing manna in different ways. The message for us in the same: let’s not let something get in the way of our dependence of God. Even food. Even wheat. It really is too easy to let something such as food get in the way of our dependence upon you. Maybe it’s food today and money tomorrow. Help us identify those things that keep us from full depending upon you. Place a desire for us to only want to have you. Amen. But God has listened; he has heard my prayer. Praise God, who did not ignore my prayer or hold back his love from me. 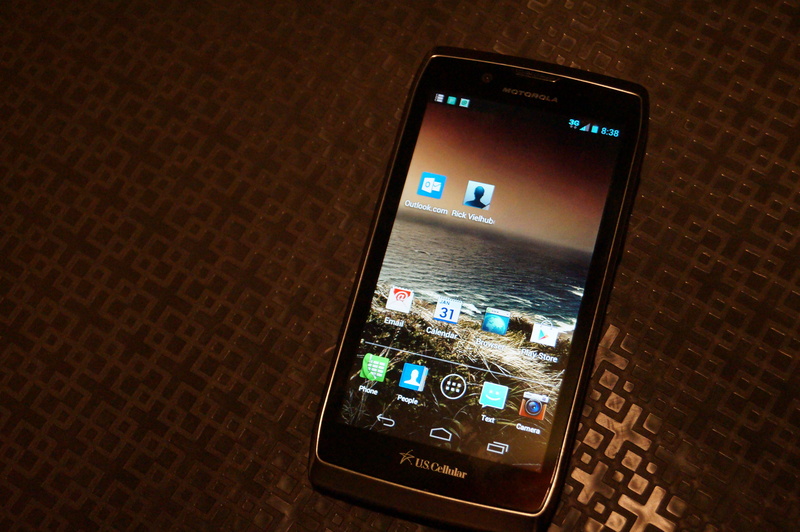 Finally … a phone with a working mobile hotspot! An early concern about being at my in-laws was having internet service. They do not own a computer and their farm is in a bad location. A neighbor told me how difficult it has been to get internet service. I knew this would be a challenge. After no internet the first week, I went to our cellphone provider and got a hot spot, a portable modem. The sales person assured me if I had cell phone reception, the hot spot would work. I had 15 days to try it. The hot spot was less than hot. It worked one second and the next second, not at all. Things that should take a couple minutes took 30-60 minutes, if at all. I returned it. The next suggestion was using an Android phone as a mobile hotspot. For years, I had a Blackberry. I had tried an Android a couple times but always returned to a Blackberry. To get internet service, I purchased a new phone. The second day I had the phone, it would not charge. I went to another store for help. The day after I switched phones, the entire company went down for a week to update their system. No one’s account could be accessed. The only option was a loner phone until their system was back up. Sometimes, the new phone charged and sometimes the mobile hotspot worked and sometimes it didn’t. I had 15 days to try this phone. I stopped twice to report the phone was not charging and internet was spotty. The store ordered me a replacement phone. The shut-down drug on and I am only near this store one or two days a week. To get internet service, I went to the neighbor’s or the library or Culver’s. It was becoming quite a hassle. On day 16, I went to the store. The system was up and running. Because it was after day 15, they would not exchange the phone even though the new one was in the store. My only option was to have the main company send a new phone to my in-laws. Ugh. More hassle. The phone arrived and I got it activated. But internet service was still not working. Back to the store. The sales reps were stumped. Another call to the main company. The drivers were out-of-date. With updated drivers, back at the farm, I sat with bated breath. Finally, I had a phone with a working mobile hotspot. This was a two-month ordeal plus several multiple hour phone calls about billing. Rick asked if internet was necessary. I feel it is. Recently, the mobile hotspot came in handy. While at a Christian women gathering, the speaker needed an internet connection for her equipment work. It took a few tries to get her equipment connected to my mobile hotspot, but it did and she shared her presentation. At multiple points through this aggravating and irritating process, I have thought of communication with God. How many times has God tried to communicate with me and my system was shut down? Maybe I caught part of the message but because of a malfunction, I missed some. When have people tried to share with me a message of God and I simply did not have good customer reception? When my prayers do not get immediately answered in the way that I want them answered, I blame God’s drivers for being out-of-date. When I do get an answer and I don’t like it, I pray up complaints and want a refund. Let us be thankful that we have a God that never stops communicating with us, even when we get frustrated and think it’s a hassle to communicate back. God’s cell phone and internet service are never down. Thanks be to God. Lord God, you never stop speaking to us, though we struggle to pause long enough to listen. Slow us down enough to listen for your voice in our lives. Call us, O God, once again. Thank you for always hearing our prayers and being patient with us. Amen. Braeden’s 5th grade team is also in red. Keep your eyes focused on what is right, and look straight ahead to what is good. Be careful what you do, and always do what is right. What would fall in American be without football? 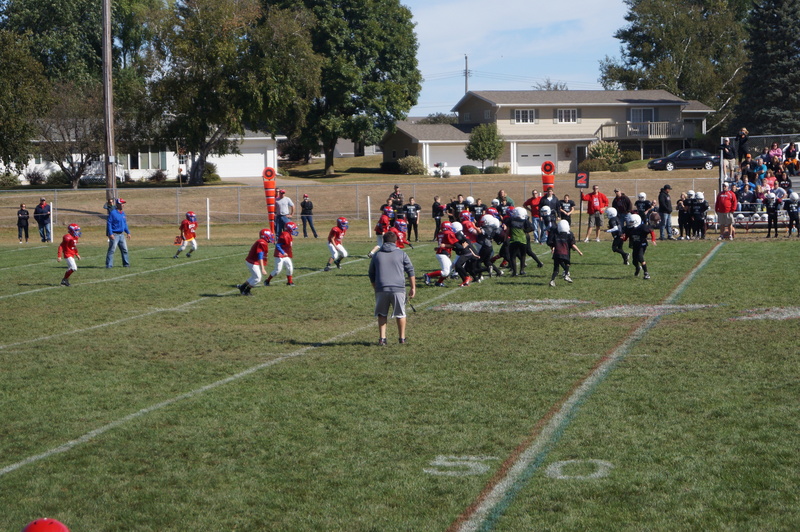 Last Saturday, Rick and I watched two football games in which our two oldest grandsons played. Bryce is in 4th grade. His game was an intramural game with 11 kinds on a team. The coaches rotated the kids through various positions the entire game. Then, we watched Braeden’s game. In 5th grade, his team played a team from another school. Braeden’s team had 22 players, enough for two 11 player sections. 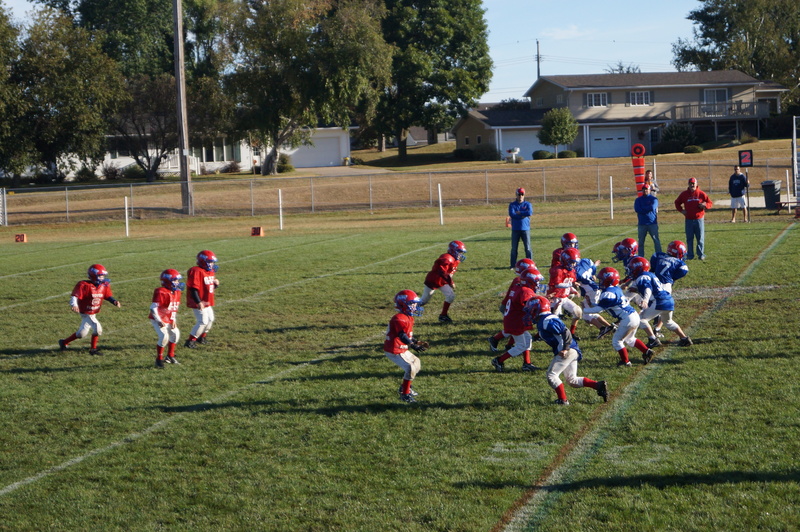 In the first half, Braeden’s section played defense and the other 11 kids played offense. They switched at half-time. Braeden’s team played with a little more skill and precision, but not without error. Penalties and fouls were pointed out but yards were not lost. While playing defense end, the boy blocking Braeden simply wrapped his arms around his waist and held/hugged him. One coach told Braeden how to legally get loose and not give up. But it was hard to get out of the hold. Sometimes we get wrapped up in things that get in our way. Nearly every day, I begin with a “to-do” list. Most days I would need 30 hours day to get everything done. By mid-day, I am often distracted and doing things not on the list. At day’s end, I sometimes feel defeated because I did not accomplish more. It happened again tonight! Sometimes, the distractions are more important than anything on the to-do list. But I also let distractions be an excuse for not doing something I’m unexcited about doing. Life is not simply a to-do list. Jesus began every day with a detailed to-do list. He let himself be guided by the Spirit. But he clearly knew what was most important: daily spending time with his Father; developing strong relationships with those closest to him; making time for people on the fringes of society. As Rick’s son, Darran, was picking up the youngest two kids from me late this afternoon, he said the last several days had been filled with endless delays. We can get frustrated and overwhelmed by things out of our control. Or we can seem them as opportunities to capture something we otherwise would have missed. Distractions and delays can annoy us … or they can be the Spirit teaching us. Which option do you focus on? May we be encouraged to do what is right, even if it wasn’t part of our original plan. Lord God – why do we sometimes lack patience? Why do we get wrapped up in not doing the right things? I pray that daily, we will seek our guidance in our lives so we can look straight ahead and see what is right. Amen. Items ready to hand out to the athletes. Just part of the water at our pit stop. 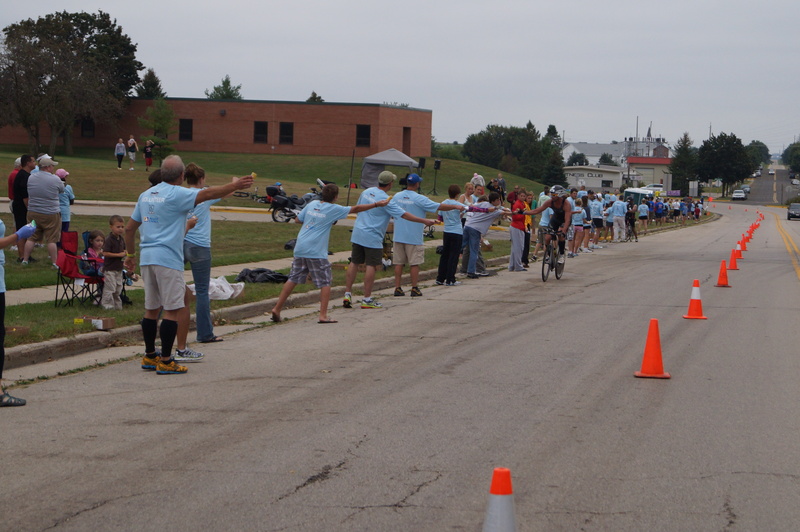 Blue-clad t-shirt volunteers lined up to fuel-up Ironman athletes. On Sun., Sept. 8, Madison hosted the Ironman Wisconsin. This is a physically daunting event where participants swim 2.4 miles, bike 112 miles and run a full marathon (26.2 miles) in one day. I volunteered at a bike pit stop station in Mt Horeb, 20 minutes from our home. I was humbled to hear people had driven three hours from Chicago that morning to volunteer at the pit stop. As the swim began at 7 AM, we set up the pit stop. 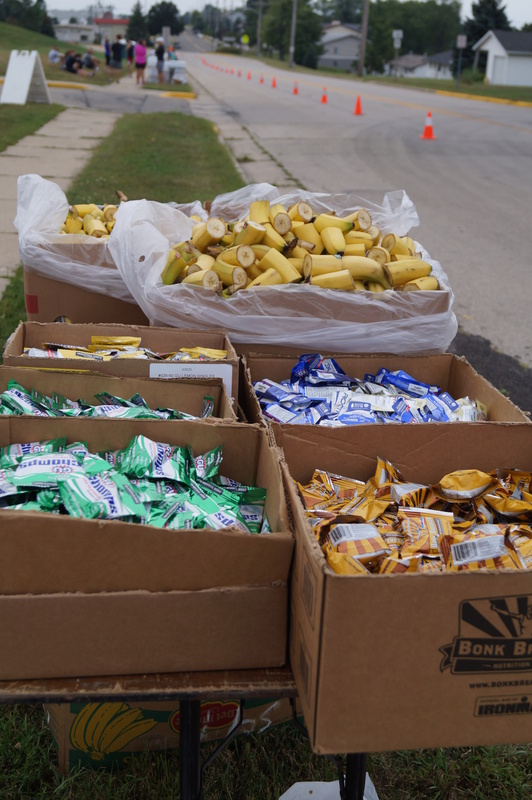 We handed out water, a power drink, GU packets (a carbohydrate gel packet), bananas and small energy bars. 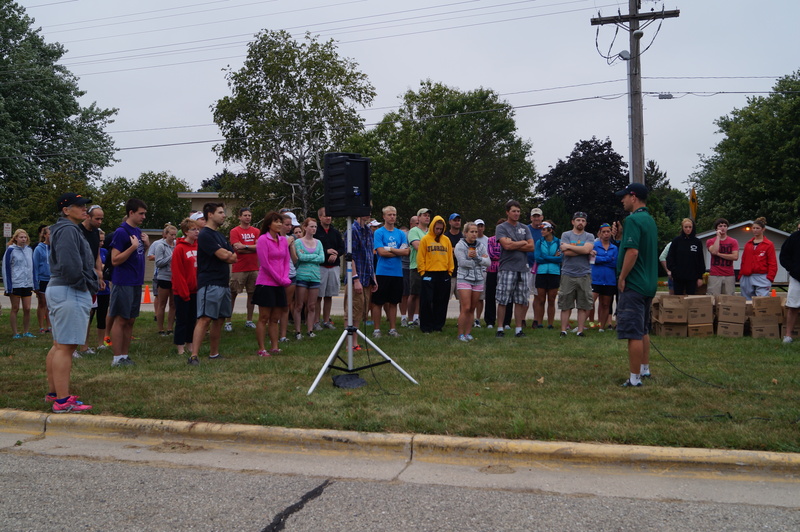 We were instructed how to properly hand out items, not get in the way, slow participants down or cause accidents. The bike route was two loops of the same route. Our pit stop was mile 30 and mile 70. Just before 9 AM, the first professional participants came whizzing by. Despite the pit stop being on a slight incline, these uber athletes were not fazed. We noted the first woman. After the professionals, athletes arrived in groups. Most athletes had drinks and food strapped to their bike. 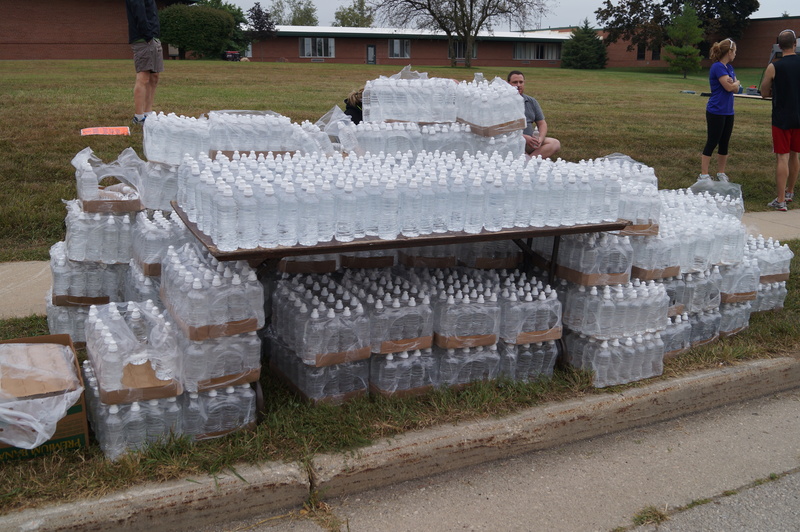 Some simply refreshed their water or power drink supply. Others depended upon what we were handing out. I was a banana hander-outer. We told the athletes what we had. In a few hours, I yelled “Banana!” hundreds of times. It was helpful when the athletes told us what they wanted. Some hand-offs weren’t clean. There was another banana person after me, so they had another opportunity to snag one. 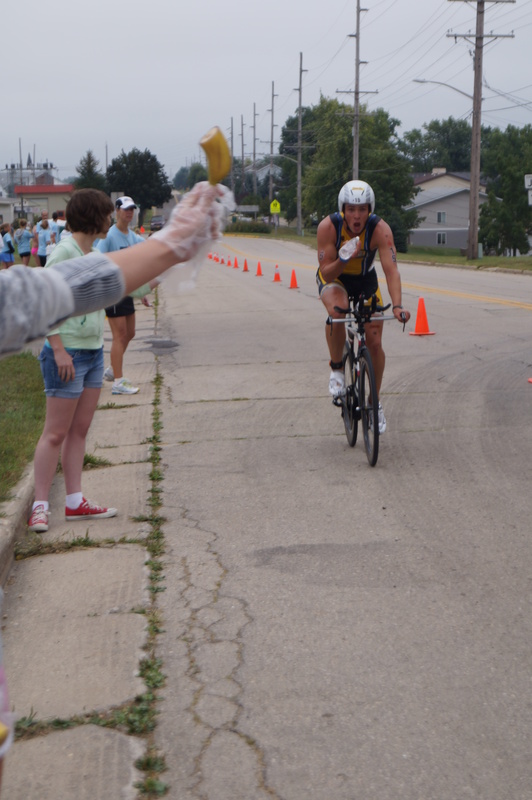 One way to enter an Ironman is to volunteer. Several folks at the pit stop planned on being in line the following morning with their blue “volunteer” t-shirt to sign-up for the 2014 event. While it sounded intriguing, I should try a mini-triathlon before signing up for the granddaddy. I also need to get into better shape and see if my aging body can handle the physical stress of a full-blown Ironman. What these athletes do is amazing. I have biked over 100 miles on a ride and run a full marathon. Just not in the same day. The winner crossed the finish line at 8:40:15. He ran a 3:06:09 marathon. While not Olympic marathon speed, he completed a 4:34:58 bike ride before switching bike clips for running shoes. The first-place woman crossed at 9:47:07. She averaged 20.52/miles/hour on her bike and 7:28 minutes/mile running. Impressive. When the New Testament was written, Olympic events happened in Greece. Winners were crowned with a natural wreath of olive branches and leaves which lasted just a while. They soon died. As Paul wrote about running for a crown, people knew he was talking about this. The crown we should be running for should be an eternal crown. It doesn’t come from completing the Wisconsin Ironman. It comes as we complete the task Jesus gave us of testifying to the good news of God’s grace. Watching the Ironman Wisconsin was impressive and inspiring. Every clapped loudly as two brothers came by. One has Cerebral Palsy. His brother road a three-wheeled bike with his brother strapped to the front. Another man pedaled up the hill with a disabled woman strapped to a tag-along behind his bike. As impressive as the professional athletes are, true Ironman heroes are the Joe-average athletes who train thousands of hours with time away from families, friends and jobs. As the day continues, it is less physical and more of a mental and emotional challenge. The most important race I shall ever run is testifying to the good news of God’s grace. Some days, it’s easier to do than others! At times, it is emotionally and mentally draining, as well as physically and spiritually. My goal is not to be the best Christian: it’s to represent God’s grace in my daily living, attitudes and choices. When we do this, I believe there is an eternal crown waiting for us. It was truly inspiring and amazing to witness athletes complete an Ironman. May it renew within me a passion to complete the greatest race of my life: to witness to Your grace daily. Give me the mental, emotional, physical and spiritual maturity to complete this great race for your kingdom. Amen. Ellie checking out Frost in the shed with Bambi in the background. Jesus said, “I am the good shepherd; I know my own sheep and they know me, just as my Father knows me and I know the Father. So I sacrifice my life for the sheep. The lambs arrive! Flower is on the right and Bambi is on the right. 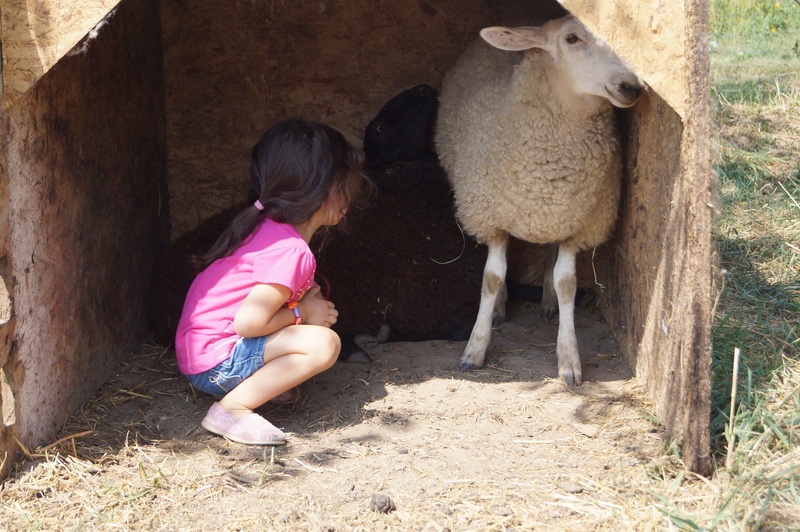 Raising sheep has been in my family for a long time. My sisters and I raised sheep through 4-H. Later, my Dad kept some sheep. My nephew Kevin is the latest Deaton to have sheep. For years, I have talked about having a couple calves or sheep. This summer, Rick relented. Possibly he wants me to enjoy something for myself as I help care for his folks. He decided a couple sheep were easier than a couple calves or something else. We made arrangements with Kevin to borrow a couple sheep and try it. There is a fenced in pasture close to Rick’s son, Darran’s house. We asked if we could section off a small part for the sheep. Darran was agreeable. 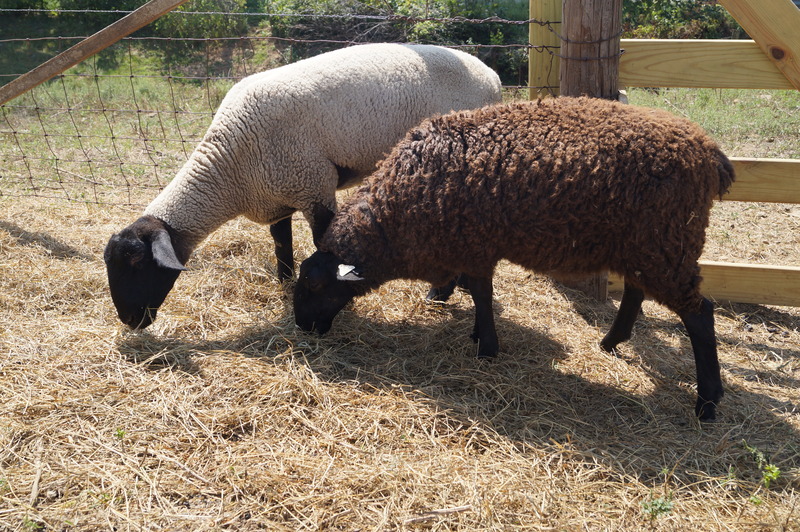 Since I was going to be near Augusta one day, we decided I should bring the sheep back. Rick had only a day to make fence. Six-year-old Waylan came out and helped Grandpa build fence. Darran even helped out. Waylan was so anxious for the sheep to arrive. He talked non-stop about the lambs. Flower and Bambi have been a hit. They are very tame. The grandkids can easily pet and catch them. When I do something with the sheep, Ellie and Waylan are willing helpers. Rick built a little three-sided shed. After we put it in the pasture, I lead them into it. The next day, they comfortably laid in the shed. They knew it was theirs. Flower and Bambi are from the same flock. But I’m not sure they were “best” friends before arriving at our farm. They quickly became best friends. When I walk or bike by, the lambs start bellering as soon as I am in sight. They come running down to the fence. They love attention. Soon, Flower will need to be bred so she can have a lamb. We decided to keep lambs at our farm a few more months. This past weekend, Kevin showed sheep. On the way home, we sent Flower home. In exchange, Bambi’s twin sister came back with us. As soon as the lambs into different trailers, Flower and Bambi were baaing back and forth. They missed each other. While Frost is Bambi’s twin sister, maybe she forgot this and wanted her latest best friend, Flower. While Kevin and his mom spend a lot of time with the sheep, it took a minute for Flower to remember them. Of late, Darran, the kids and I have been her shepherd. We have fed her, watered her and given her attention. When Kevin tried to sooth her, she didn’t buy it. Today, Ellie, Dylan and I went out to see how Frost is adjusting to her new digs. Bambi and Frost were in the shed. Frost let the kids pet her and feel her soft wool. We talked to her and she warmed up quickly. The lambs followed us down to the gate. Bambi knows who might feed her and Frost tagged along. They know we are their shepherds for the next several months, something we enjoy. Jesus told us that he is our good shepherd. When we are his sheep, he knows everything about us: what we like or don’t like; what makes us happy and sad; how our voice sounds and how we want to be loved. There’s one difference with him as our shepherd. He was willing to sacrifice his life for our benefit. He just didn’t act as our shepherd. He lived as our shepherd. Would I give up my life for Flower or Bambi or Frost? Hard question. It wasn’t a hard question for Jesus. He just did it. What a shepherd. Lord God – How easy it is to blame you when we encounter a pressured-filled situation. We want to change You rather than change ourselves. Help us remember that you walk with us through those faith preserving times of our lives. Encourage us to discover faith that perseveres. Amen. Beautiful cucumbers from the Evelands. Some of the pickles and spaghetti sauce. By faith Moses left Egypt, unafraid of the king’s anger; for he persevered as though he saw him who is invisible. I love to can. Unfortunately, our garden is not doing so hot this year. I was not confident I would have enough veggies to can or freeze this year. 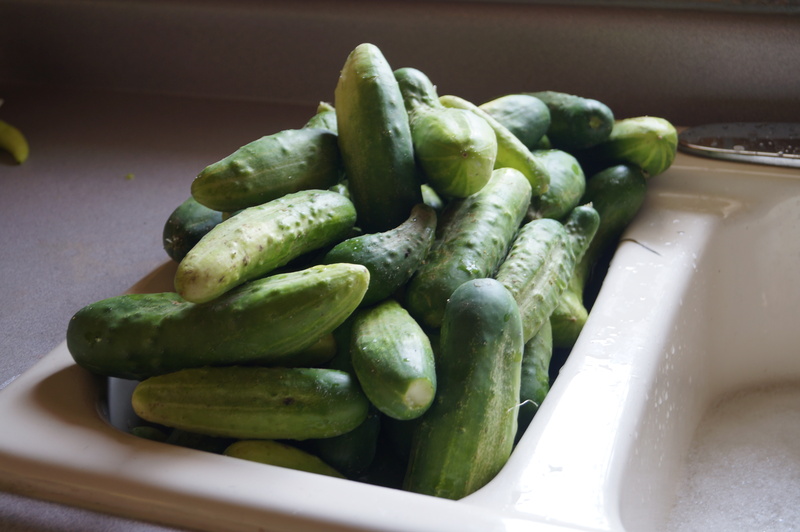 While at a local high school football game, friends said their family garden had an abundance of cucumbers. The next morning, I had a milk crate of cucumbers in the kitchen sink. 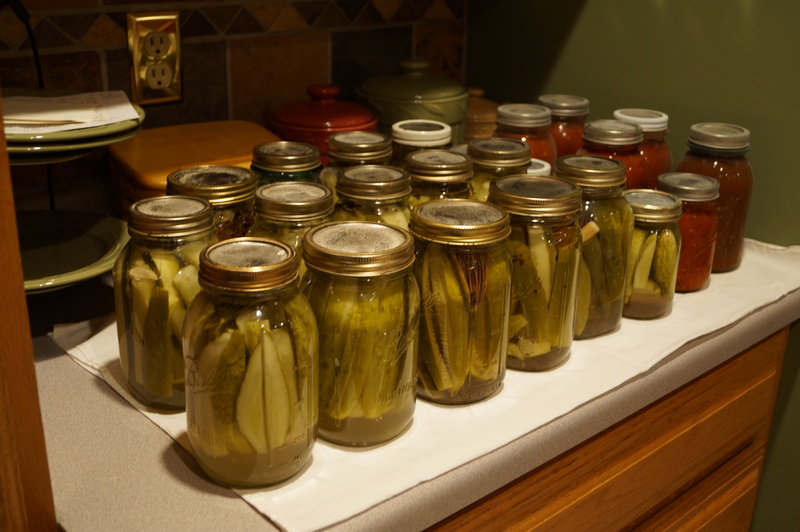 By day’s end, we had 16 quarts of beautiful dill pickles. While we have some tomatoes, it is not the normal crop. I debated if I had enough to can. While at the local garden market, I saw boxes of tomatoes for $8. Sold. 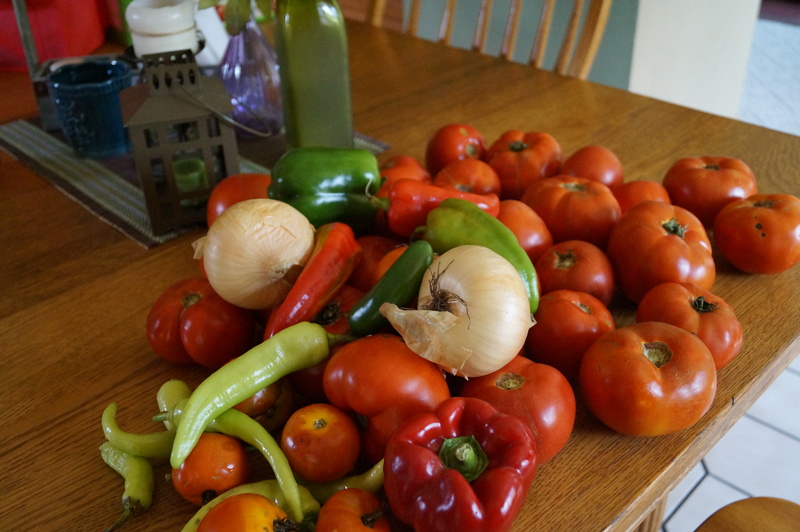 I went home and began making my favorite spaghetti sauce and salsa. I laid out the wonderful, fresh ingredients on the kitchen table and marveled. Brilliant colors. Smooth, soft skins. Powerful flavors. Fresh aromas. Ahh! As beautiful as they looked and smelled, this would not last long. The way to preserve them for the winter is to cook them, bottle them and process them. Those gorgeous veggies become yummy sauces and bases for lip-smacking-good lasagna, a great dip for chips and mouth-watering casseroles. Soon the kettle was cooking. A few days later, I sent my father-in-law to get sweet corn from a neighbor, offered to us. A couple hours later, I had multiple containers of creamy corn to freeze, a favorite at Vielhuber family gatherings. These vegetables began as little seeds and become plants that produced colorful, yummy vegetables. But veggies only last so long. 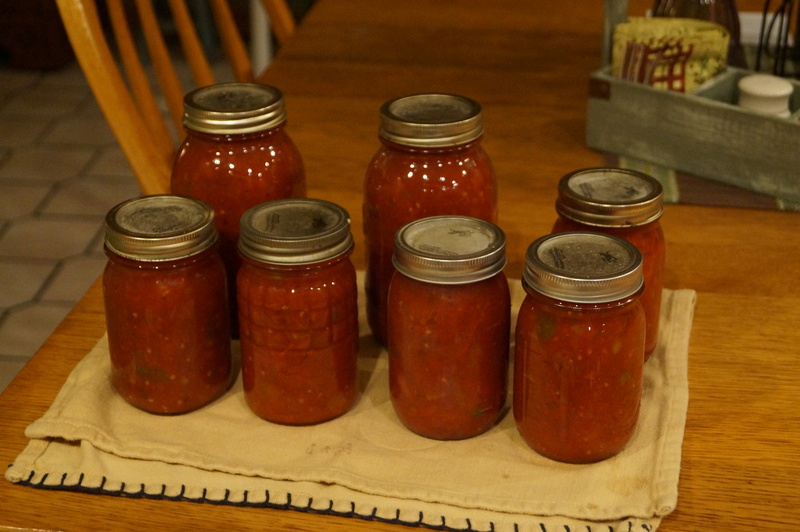 When preserved through canning or freezing, they stop growing and are food we enjoy all winter. This happens as they are cooked with heat, processed with boiling water and chemically changed. Christian faith experiences similar situations. Raw faith is exciting and fresh. When difficult situations arise and we experience heat, faith discovers if it can persevere. Faith needs to encounter boiling points so we learn not to depend upon ourselves. We depend upon the One who journeys with us daily. Like the veggies, we need a chemical change inside of us to discover how to persevere in our faith. Moses had been through a pressure-cooker situation. He’d watched Pharaoh and the Egyptians withstand 10 awful plagues. Finally, Moses was allowed to leave with the Hebrew people. As he left, he acted as if the Invisible One was visible. That’s how strong his faith had become. Pressure and challenging situations are not fun. Remember the veggies and what happens to them as they are preserved. I pray your faith is just as preserved. Have a holy meeting on the first day of the festival, and don’t work that day. It’s Labor Day: the day we take a break from our normal work activities. As I was planning the day with my mother-in-law, she said, “Isn’t today a holiday!” While it is, it is harder to think of it as a holiday when Rick is working. For several years, Rick and I went to Dubuque, Iowa on Labor Day for an annual outing with one of my seminary professors and his wife. We’d run or walk a 5K down by the Mississippi riverfront. Les, my seminary professor, is a much more accomplished runner than I am. With specific goals in mind, he’d check off the goals as he accomplished them. I was happy just to finish! The first year, Les’ wife, Linda, and Rick volunteered along the route. Eventually, they both ran or walked. After the 5K awards were announced and Les retrieved his hardware, we would go to Perkins for a long, extended breakfast. The run was a good excuse for us to get together with the Longden’s. Les and I talked ministry shop while Linda and Rick talked about everything but church things. All four of us enjoyed conversations about gardening, tractors, kids and grandkids. We’d end with hugs and promises to do it again next year. We really enjoyed this Labor Day tradition. Unfortunately, this stopped when Rick’s work schedule changed. He now works on Monday and we miss this annual event. Today seemed a little flat with no 5K and breakfast. More importantly, I missed the long conversation. We just haven’t put into place another annual event. Sometimes rituals can become too ritualistic. But traditions are important. Jewish people celebrate very specific major celebrations each year. They tend to be filled with tradition and are tied to very specific events from their history. For Christians, the two biggies are Easter and Christmas. While Labor Day is a secular holiday, it can still have specific traditions. This is a good thing. Think of the traditions that are most meaningful to you and what time of year they are tied to. Would you miss those traditions if they stopped? Is there a tradition from you childhood that has not continued? Why? Can you put it back into place? Discern these traditions. Maybe you are the one to re-discover them and make them meaningful for your loved ones. Lord God –Too often, it is only when something does not happen that we realize how meaningful it is for us. Help us rediscover a meaningful tradition and encourage us to put it back into our lives. May this tradition reflect your love and grace in our world. Amen.